Cryolipolysis allows a significant reduction of fat, without surgery, pain or risk. The new method is without surgery and without risk of affecting the tissues as do the laser or ultrasound. From the first session, results can be up to -4cm, depending on the area being treated. The effect is rapid because part of the fat cells is destroyed, while the other part will be eliminated gradually within 2 to 3 weeks only! These slimming sessioans are addressed to all people who want an effective treatment to slim down, lose belly, and eliminate cellulite. How does a slimming treatment work? Conventional Cryolipolysis centers indicate that it will be necessary to wait 2 to 3 months to obtain a visible result. 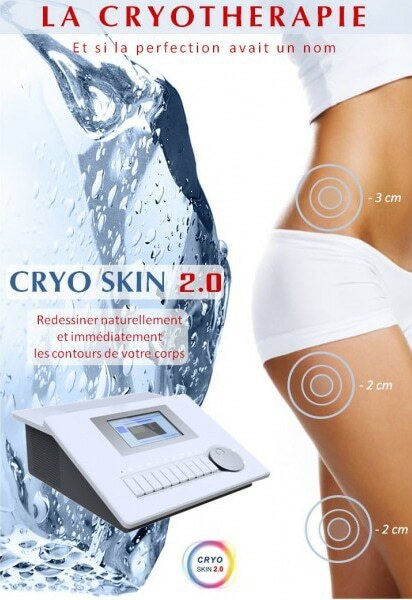 Conventional Cryolipolysis devices require about 2 hours. Conventional Suction Cryolipolysis devices only process at the suction area. Conventional Cryolipolysis devices have aspiration and there is a risk of hematomas. How does slimming work with Cryolipolysis? Scientists in the United States know the power of cooling on the cell destruction and elimination. This new natural treatment allows fat overloads to be eliminated immediately by the application of controlled cold for 20 minutes. In one session, about 30% of the treated greasy tissue can be removed. And approximately 80% of the final result is obtained in 2 to 3 weeks depending on the individual. Within a duration of 20 minutes, the treatment is carried out manually by performing a massage type rolling palpation with a nozzle that diffuses heat and then gradually cools down to reach -10°C. The very important temperature variation of the fat cells allows a more efficient and quicker elimination. Breast prostheses, Pregnant (and/or breast-feeding), Menstruation, Elderly people, Children Obesity important, Extreme flaccidity, Heart disease transplant, serious Osteoporosis (stage 3), Cryoglobulinemia, Hypoprotidemia, serious disease (cancer). Allergy to cold (Reynaud syndrome), Phlebitis, Varicose veins, Lower limb arteritis, Cold urticaria, Umbilical / inguinal hernias, Severe diabetes, Liver diseases, Cardiac pacemaker, Metal implants Dermatitis, Wounds, Skin inflammation, Recent scars. A session of Cryotherapy less than 15 days. These costs are extremely advantageous compared to liposuction (€3,500 to €4,000) and to conventional Cryolipolysis centers where the cost of a session varies from €200 to €500 for the targeted area for aspiration. For a “liposuction” effect, a cure of 6 or 12 sessions is necessary according to the morphology. A diagnosis will be made during your first session. Everyone is different. Results may vary from person to another.